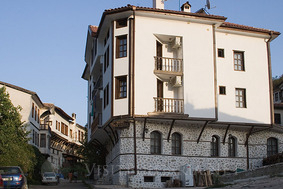 Bolyarka Hotel in Melnik town in Bulgaria. Book holiday or vacation in Bolyarka Hotel in Melnik resort. Location: Hotel Mehana Bolyarka is situated in the heart of the beautiful town of Melnik. Accommodation: Hotel "Bolyarka" offers a total number of 58 beds, which are distributed in: 2 luxury apartments, 2 small apartments and 17 double rooms. All the rooms and apartments are furnished with mini-bars, cable TV, telephones, individual bathroom and even a weekly temperature programmer. Apartments have a fireplace as well. Relax centre: For your best time at our hotel we offer you lobby bar, sauna from Finland, fitness, conference room with 10 - 12 places, and a great wine cellar for tasting domestic wines. Wine & Dine: There are 58 seats in the tavern and a garden with barbecue with 42 seats. You can try original Bulgarian and local meals - spicy beans cooked in a pot, the famous hominy (kachamak), the original Melnik banitsa, a variety of lamb or pork shish, kebabs on barbecue and many other specialitets which are the great surprise for the guests. Bolyarka's tavern offer a wine taste cellar.